If you're working on redesigning your home's interiors or are just in the market for a new couch, choosing upholstery can be quite a bit of fun. From browsing color options to feeling different fabric textures, you'll be surrounded by more options than you probably ever imagined. Before all these options start to get overwhelming, know what options will work for you and your home. 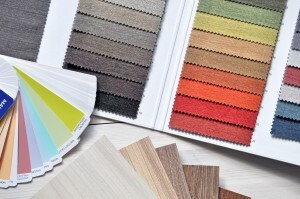 While most people mainly pay attention to color choices, keep in mind that the fabric type can play a huge role in how long your new furniture lasts. If you're not sure what to consider when trying to narrow down your options, check out these tips. Durability is important because you probably don't want to invest in something that will no longer function in a short amount of time. If you have pets or small children in your home, durability will be even more important. We know your pets mean no harm, but they don't know when their paws aren't clean or when their nails are too long. This can mean snags, tears, and stains on your upholstery. Children also don't mean any harm, but they also don't see the risks that come with eating a spaghetti dinner and drinking red punch on your brand new couch. To fight any potential stains or snags, pay attention to the upholstery you're investing in. Dark colors are better because they hide stains, but also think about the type of fabric you want. Indoor/outdoor materials are great because they tend to be sturdy and woven patterns will last longer than printed patterns. Keep in mind that a higher thread count and a tighter weave can result in a more durable fabric. Instead of covering your furniture in uncomfortable plastic like your grandma did, consider slipcovers. These are easy to remove and clean just in case a spill does occur. If you don't have pets or children to worry about, feel free to pick what you like! You can indulge in finer fabrics, lighter colors, and more delicate features as long as you know you'll do what is required to keep your furniture in top shape. You might have to set some rules like no eating on the couch or no drinking red wine anywhere near the couch, but the choice is definitely up to you. If you love the carpet cleaning services offered by Tacoma Cleanpro, then you'll be happy to know they also offer upholstery care services! To get your carpet clean and your upholstery looking great, contact Tacoma Cleanpro at (253) 229- 7499. Does It Make Sense for the Room? Even if you don't have pets or children in your home, you may still want to consider a few more factors before making your final choice. To start, your upholstered furniture should match the room in which it will be placed. Take note of the flooring, the color of the walls, and any decorative accents that contribute to the theme of the room. The fabric you choose should make sense in the room and should fit in seamlessly. Pick an upholstery color that also matches, which doesn't necessarily mean it has to be the same color. You can pick a color that is different but that still fits the color palette you already have going on. If you're not sure how to make things match, keep in mind that neutral colors are always a good option and steer clear of patterns if you're not sure. Does It Make Sense for the Piece? Finally, be sure that the upholstery you choose for a piece makes sense for its size and placement. If you're choosing upholstery for a large item, like a couch, a solid color will look better than a pattern. Keep in mind that a pattern may look nice on a swatch of fabric, but it may not translate well when covering a large area. Patterns aren't a bad idea, but they may be better suited for smaller, accent pieces. A pattern doesn't have to cover a whole couch to make a statement, so choose your pattern wisely. If you get a new stain on your upholstery, don't rush in with just any cleaning solution. Be sure you understand how to clean it or when to call a professional. If it's time for your next carpet cleaning in Tacoma, contact Tacoma Cleanpro at (253) 229- 7499. Their professional carpet cleaners can have your carpet looking its best in no time! What's even better is that they also offer upholstery care services to keep your upholstery looking and feeling great!